A PATTISON Outdoor digital matrix accepts donations via a “tap-to-give” payment terminal in support of CARE Canada’s #SheToo initiative, which is part of CARE’s March4Women campaign. 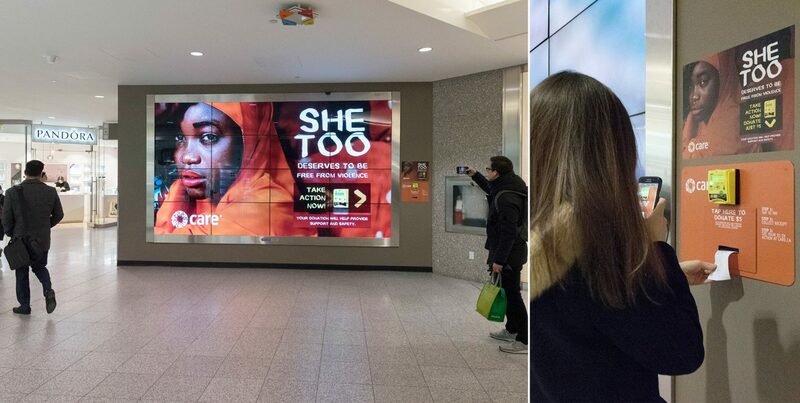 TORONTO, ON, April 4, 2018 – PATTISON Outdoor, Canada’s leading Out-of-Home advertising company and its digital innovation arm, Fourthwall teamed up with Jungle Media to promote CARE Canada’s She Too movement in an interactive campaign that launched this week in Toronto’s PATH. In the execution, a PATTISON digital matrix is reframed as a digital donation wall, where passersby are offered an opportunity to directly engage with CARE’s overall mission. The She Too campaign is a part of CARE’s March4Women initiative, which aims to overcome poverty and discrimination by creating equal rights and opportunities for women and girls in developing countries. Found in the Royal Bank Plaza of Toronto’s downtown PATH, CARE Canada’s four-week interactive stunt is a first for the charitable organization, and the Canadian Out-of-Home industry. With Fourthwall handling the production and installation, the “tap-to-donate” panel was designed to accept preset donations of $5 using a cashless payment terminal, accepting credit and debit cards as well as smart phone payments. A full-motion digital spot, vinyl poster and branded payment panel were also designed by Fourthwall to direct passing donors to the terminal. To complement the campaign, brand ambassadors from CARE Canada will be scheduled on-site for a portion of the campaign to answer any questions consumers may have about the organization and its work. Appearing in the busy retail concourse of Toronto’s Royal Bank Plaza, this execution is a part of a larger, general awareness campaign in-market since March 1 that includes PATTISON Transit Interior Cards in Calgary, Ottawa and Toronto; PATH posters; TTC digital network creative, along with newspaper insertions, TV Closed Captioning placements, other Out-of-Home spots and digital display advertising. CARE Canada is an international humanitarian and development organization committed to saving lives, defeating poverty and achieving social justice. Active in more than 90 countries, CARE places a special focus on women and girls as it believes we cannot overcome poverty until all people have equal rights and opportunities, visit www.care.ca. Founded in April 2010, Jungle Media has grown to become a national influence on the media scene, winning awards for both innovation and leadership. Our goal is to deliver creative, strategic and results driven media campaigns for our clients. We work as experts in an evolving landscape, creating media that didn’t exist and exploring new species of media.